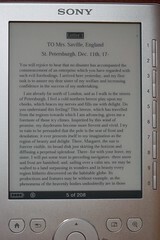 Before I compare websites where you can download e-books in the EPUB format, I should tell you that I just got a Sony Reader Pocket Edition Silver PRS-300SC from my husband on Valentine’s Day. I’ve spent a bit less than a week with my new e-book Reader, but I’ve crammed a lot of reading and researching into the past five days. I’m pretty well versed in typography, and I have been disappointed with the readability of some of the e-books I’ve put on the Reader. 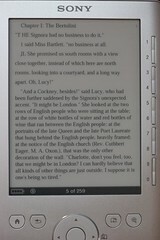 Having viewed various books on the Reader, I don’t blame the Reader; I blame the formatting of some e-books. In an effort to find more readable e-book formats, or styles, I went a-searching, and these are the results of my trials. First off, I found that PDFs are difficult to read on the Pocket Edition. I discovered this when I went to my local library’s digital download site and downloaded four books by Nicholas Sparks — all formatted in the same way by Warner Books in PDF. The margins were huge, the font size small, and the font face’s x-heights very small. (To oversimplify, x-height is the difference in size between capital letters and lowercase letters. Fonts with small x-heights look classy, but are not readable at smaller sizes.) These books were impossible to read at the default “small” size on the Pocket Edition. Not only that; the printer’s crop marks were visible, which made the margins even bigger since what I saw on my screen included extra margins that shouldn’t be visible to the consumer. I had to set the text on these PDF books to “medium” size to make them readable. That makes the type large enough, but it breaks the formatting. Chapter headings show up two or three pages into the chapter rather than at the beginning of it. Lines occasionally break early or, worse, words break from one line to the next. No doubt, PDFs like these might be readable on a larger Reader, such as the Daily Edition, but I prefer the compact simplicity of the Pocket Edition, and I think digital libraries should make their digital books look good on smaller devices. Instead of offering PDFs of hard cover books, perhaps they could offer PDFs of paperbacks, because they are formatted to be more readable in small form, where you will find thinner margins and more readable fonts. Ideally, a text should be readable on any device. I have been a proponent of device independence for years now, and I suppose I knew that PDF was not a device-independent format, but reading PDFs on a small device really made me see it. 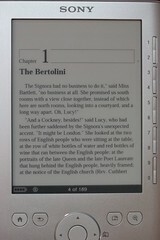 I suppose that is why the EPUB format was developed with e-book readers in mind. 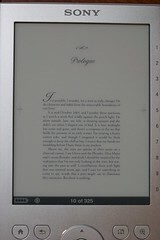 Unlike PDF, EPUB e-books are designed to be readable on screen as opposed to on paper. 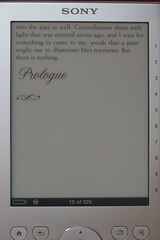 I notice that, with the EPUB format, I don’t see misplaced chapter headings or lines and words breaking up. I notice the default font faces and sizes tend to be bigger and more readable; for instance, the font sizes are a couple-to-four points larger, and the font faces may have larger x-heights. I’ve been experimenting with several EPUB download sites this week. I also searched the web to see if there was anything written comparing EPUB download sites, but I couldn’t find anything. So here is my — albeit limited — comparison of the EPUB books I’ve downloaded from (in alphabetical order) epubBooks, Feedbooks, Google Books, the Greater Phoenix Digital Library (powered by OverDrive), The Gutenberg Project, Smashwords, and the Sony Reader Store. When I download EPUB books from the Greater Phoenix Digital Library, which offers books from OverDrive, I don’t know what I will get from book to book. One is readable at default size while another is more readable at medium size. 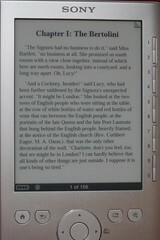 EPUB books from OverDrive offer the benefits of the EPUB format I listed above, but there is no standardization. Still you can get some good EPUB books. At the time of this writing, though, the selection of EPUBs is limited; there are only 653 EPUB titles while there are 15,831 PDF titles. When I download EPUB books from Google Books, I notice typographical anomalies due to OCR scanning errors. (OCR stands for optical character recognition, a program through which a scanned image of text is run to convert it from a picture of text to actual text.) Due to these uncorrected OCR errors, nonsense characters may appear on the page, lines may be broken in strange places, and letters might be missing here and there. Free, yes, but not very readable. On a positive note, Google offers a way for readers to report scanning errors so they can improve Google Books for the public good. I also discovered Smashwords through Aldiko. Like Feedbooks, it’s a place to get both free and paid e-books (in EPUB and other formats) and it’s also a publishing platform. I don’t like their site as much, though, nor do I like the style of their EPUB e-books. It seems fairly similar from book to book, but it’s not as elegant and readable on my Reader as the e-books from Feedbooks. When I looked at the first pages of the EPUB books I downloaded from Feedbooks, I saw that most of the texts were actually from The Gutenberg Project. So I went to the source to see how I liked their EPUB downloads. Their downloads page for each title says the EPUB download is, at this point, “experimental,” but I found the e-books I downloaded to be just as readable and error-free as those from Feedbooks. They just didn’t have as pretty a style, in my opinion. Still, it’s not so much about style as it is about readability, for me, so I consider Gutenberg a good place to download EPUB books. Speaking of EPUB books, there is actually a site called epubBooks, and went there to download a couple of books as well. I was surprised to find that they did not have A Room with a View or even anything by E. M. Forster, but they did have Mary Shelley’s Frankenstein as did every other place I went to. I found it to be error-free, at least in the first pages I viewed, and simply styled. I don’t like their site navigation as much as others, but I still consider it a decent place to look for EPUB downloads. The last place I went to download EPUB books, ironically, was the Sony Reader Store [closed March 2014]. One of the reasons I wanted a Sony Reader is because I am a cheapskate* who would rather borrow books from the library than pay for them. Unfortunately, the Sony Reader Store does not have any free books. They do, however, have two different editions of Frankenstein for 99¢ or less (and, inexplicably, some that cost even more). I don’t see any reason to pay for an electronic book in the public domain that I can download free elsewhere, but the Sony Reader Store does make for a seamless process of browsing, downloading, and installing e-books in my Sony Reader Library. It’s probably ideal for people who are not comfortable with downloading and file management, because the Reader Library application takes care of that for you when you buy books from the Sony Reader Store. For the sake of good reporting, I plunked down $1.94 for two editions of the same book— one published by Mobile Reference and the other published by B&R Samizdat Express. 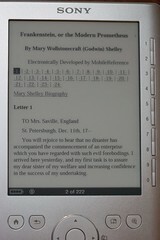 The publication by Mobile Reference was formatted just like all the others: flowing text in a font readable in the default “small” size on my Sony Reader Pocket Edition. The publication by B&R Samizdat Express, on the other hand, was styled with a font size that was unreadable in the small size, and it had bigger margins than any of the other editions I had downloaded. *Actually, when I just have to have it the day it comes out, I’ll buy a book and donate it to the library after reading it. I’ve donated a lot of books to the library over the years, but mostly I just borrow nowadays. Speaking of donating, if this article helped you make some money-saving decisions, then please consider donating a dollar or more to my blog. Thanks! 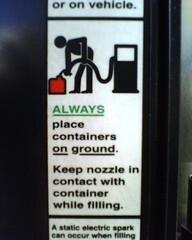 I noticed an interesting use of underlining at the gas pump today. I learned, when studying typography, that underlining is mostly a relic of the typewriter, which was incapable of emphasizing text with italic or bold typefaces, and that other means of emphasis are more aesthetically pleasing. One problem with underlining words as a way of underscoring their importance is that the underlines interfere with the descenders– those “tails” of letters that descend below the baseline as in the lowercase letters g, j, p, q, and y. I once read that a proper underline breaks at the descenders to allow them to descend without interference. I am happy to report that the typesetter of this sign knew well enough to underscore only the “round” of the word “ground” and let the descender of the lowercase g hang down without the interference of the underline. You just never know where you’ll see an example of proficient typography! Er… typography! 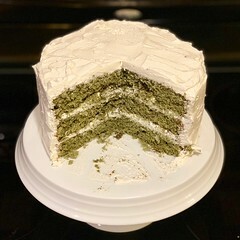 Yeah, that’s better.